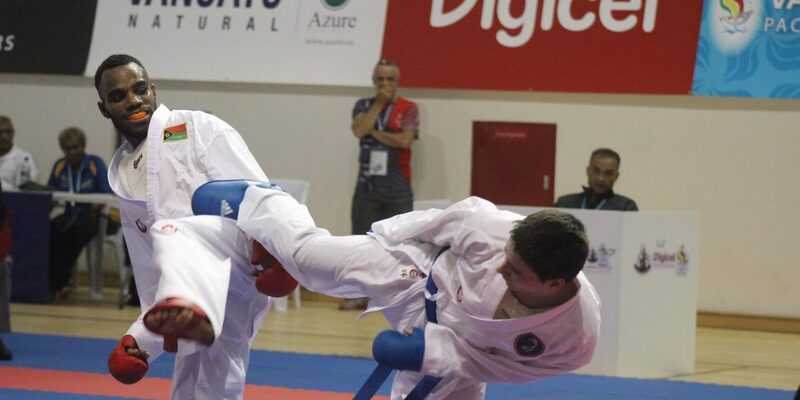 Team New Caledonia won gold in all its karate events on day six of the Pacific Mini Games in Vanuatu. In the Female Team Kata and the Female Team Kumite, New Caledonia dominated both eventsto scoop gold, leaving Vanuatu to settle for silver again. New Caledonia’s Kevin Pognon said the team was very satisfied with their collective results. “It was a good fight in Vanuatu and the Vanuatu fighters are very good too. We are happy to fight here,” Pognon said. Tumu Lango from Team Vanuatu said: “We gave our best performance even though we have only been training here in Vanuatu. They (New Caledonia) have an advantage because they have an international coach and support from international fighters, especially from the World Championships, and they have more experience than us. “But today I think we scared them a little bit.What I think we should improve is to get more exposure overseas,”Lango said.